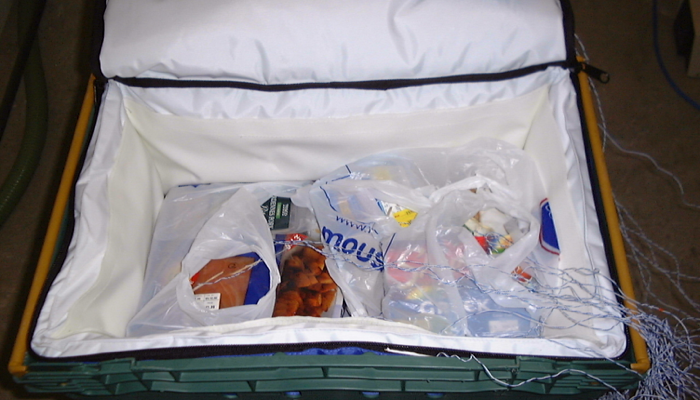 Stephen James looks at how to keep food cold without active refrigeration. The storage and transport of food without active (mechanical) refrigeration is not at all new. Icehouses were common in stately homes in the UK in the 1700’s and the transport and holding of fish under ice has been practiced for many hundreds of years. In the past few decades the dramatic increase in air freighting and home delivery of perishable foods (chilled and frozen) has focussed attention on packaging/process developments that allow food to be distributed in a non refrigerated environment without unacceptable changes to its temperature. Throughout that time FRPERC has been in the forefront in helping companies develop and verify the performance of systems to distribute chilled and frozen produce in the most cost effective manner. An important part of this work has been the development of bespoke test protocols that meet the individual companies requirement in terms of key product temperatures and times, overall dimensions and useful capacity, packing configurations, normal/abuse temperature, other environmental conditions and green issues. The use of preformed expanded polystyrene boxes has been, and still is, the most common method of maintaining food temperatures during non refrigerated distribution. Ice, ice packs, or eutectic packs are often used within the boxes to offset heat input through the insulation. Increasingly our clients are interested in replacing polystyrene boxes by other alternatives that are either considered more environmentally friendly, and/or offer them overall cost / operational advantages. Usually we have been asked to investigate systems that limit the rate of temperature rise in chilled and frozen foods during distribution. However, in a number of cases the avoidance of surface freezing in a chilled product, i.e. during airfreighting has been the problem. In others the need has been to keep food hot and in some specific non-food work to keep drugs and vaccines within a set temperature band during worldwide distribution. Snippets from our work are presented in the rest of this article to provide some idea of the extent of FRPERC experience and expertise in this growing area. 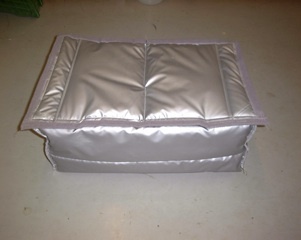 A simple way of reducing heat input into products during unrefrigerated transport, storage and distribution is to line the standard trays used with an insulating material (Figure 1). Packs of ice cream, peas, prawns, turkey burgers, raspberries and pizza at a starting temperature of -15°C were used in the trials with frozen produce. In the lightly loaded trays produce temperatures rose by 10°C on average during the simulation compared with 8°C in the fully loaded trays. In the worse case there was a 4°C temperature difference in produce in different positions in the trays. 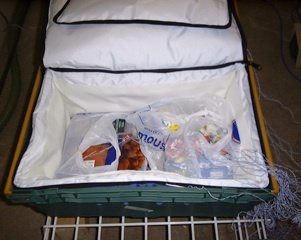 Packs of smoked salmon, chicken thighs, pate, yoghurt, Brie and ready meals at a starting temperature between 2 and 5°C were used in the trials with chilled produce. In the lightly loaded trays produce temperatures rose by 9.5°C on average during the simulation compared with less than 7°C in the fully loaded trays. Again in the worse case there was a 4°C temperature difference in produce in different positions in the trays. Our conclusions from this study were that the temperature rises measured in both chilled and frozen products were unacceptable for delivery of foods subjected to the test conditions. While these conditions can be considered severe, they could be encountered during delivery operations in warm summer periods. Slightly better performance may have been achieved with a tighter picking regime (e.g. closure of the lid immediately after addition of products rather than the more severe procedure adopted in the trials), but this alone would not give acceptable temperature control. Without refrigeration on the delivery vans, additional measures would be required to maintain acceptable temperatures, such as eutectic ‘ice packs’ inserted into or instead of the top mat or positioned in the walls and floor of the liner. In other investigations we have looked at different packaging solutions (Figure 2) and the use of eutectic packs. With frozen produce in the lightly loaded trays produce temperatures rose by up to 17°C during the simulation compared with 10°C in the fully loaded trays. The use of eutectic packs reduced the maximum gain to 13°C. With chilled produce in the lightly loaded trays produce temperatures rose by up to 11°C during the simulation compared with 7.5°C in the fully loaded trays. The use of eutectic packs reduced the maximum gain to less than 7°C. We concluded that without eutectic packs, the liners did not maintain acceptable temperatures for either chilled or frozen foods. Eutectic packs improved the liner performance with chilled foods considerably, but temperature rises were still not acceptable. For frozen foods, the packs gave only a slight improvement in performance, and temperature rises were not acceptable. In light of these results we have carried out further development work on the use of different insulation systems, loading patterns and eutectic packs to produce ‘acceptable’ home delivery production for many products. For example, we have found that for the home delivery of high quality chilled pies the use of the correct polystyrene container, pie and eutectic pack loading configurations can result in a 6 hour delivery period even at an ambient of 23°C. The surface temperature of the warmest pies, those in the corners of the box, still being below 8°C after this time and the rest well below. One key factor was the mean temperature of the pies on loading. Pre-cooling of the product prior to loading can significantly reduce the final temperature reached. Figure 3 shows that stored in an ambience of 16±1°C the pies can be kept below 8°C for more than 24 hours, pies in the side of boxes do not even reach 5°C in that time, provided that they have been equalised at 1.5°C. On some occasions all a client initially requires is a quick idea whether a new packaging system is likely to significantly better than their current system. We have a simple procedure for achieving this aim. The heat insulation properties of the material govern the rate of heat flow into the food. Using the Lees disc method we can rapidly measure the thermal conductivity of the new material and compare it with the current packaging. If the conductivity is significantly lower this is promising. Using our bespoke thermal modelling software we can quickly see what the likely effect of the lower conductivity will have on the rate of temperature rise in food of interest. A range of what-if scenarios can be rapidly investigated with different ambients and changing abuse conditions. However, the conductivity of the packaging is only part of the story. Heat can also be gained through joints in the material and bridges across the structure. We can make a simple measurement of the total rate of heat gain into the whole package by maintaining a constant temperature within it when surrounded by a lower constant ambient and measuring the energy required. At the same time we can use our infra-red cameras to identify positions of maximum heat leakage. Further modelling can then indicate the potential performance of the new system and whether it is worth moving to an experimental test procedure. With sustainability and environmental concerns of increasing interest at this stage it may be useful to carry out a life cycle and environmental analysis of the new system.